Fish are good sources of protein and healthy unsaturated fats. Unlike other animal protein sources, most fish contain little or no saturated fat, a type of fat that can increase LDL, or “bad,” cholesterol. Along with poultry and legumes, fish provide one of the healthiest sources of protein, according to the Harvard School of Public Health. A 3-ounce serving of tuna provides 26 grams of protein. This serving contains 130 calories, 1.5 grams of fat and 50 milligrams of cholesterol and provides 480 milligrams of potassium. Tuna contains no carbohydrates or saturated fat. Tuna also provides a good source of heart-healthy omega-3 fatty acids, with 250 milligrams per 3-ounce serving. You can get 24 grams of protein from a 3-ounce serving of Atlantic, Coho, sockeye or Chinook salmon. This serving contains 200 calories, 10 grams of fat and 70 milligrams of cholesterol, and provides 430 milligrams of potassium. You can get 22 grams of protein from a 3-ounce serving of chum or pink salmon. This serving contains 130 calories, 4 grams of fat and 70 milligrams of cholesterol and provides 420 milligrams of potassium. Most salmon contains less than 2 grams of saturated fat per 3-ounce serving, and none contains carbohydrates. Salmon provides an excellent source of omega-3 fatty acids. 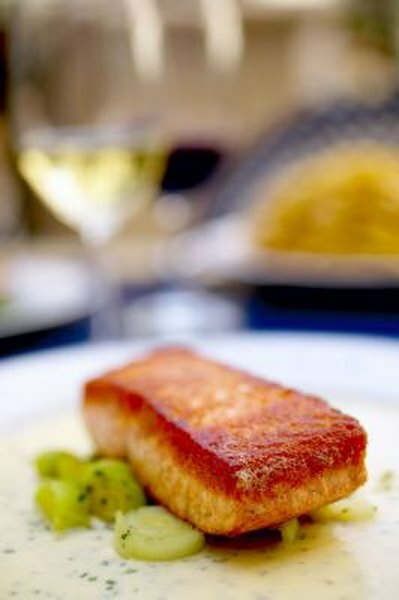 A 3-ounce serving of wild Atlantic salmon provides 1,564 milligrams of omega-3 acids. A 3-ounce serving of halibut provides 23 grams of protein. This serving contains 120 calories, 2 grams of fat and 40 milligrams of cholesterol, and provides 500 milligrams of potassium. Halibut contains no saturated fat or carbohydrates. You can get 22 grams of protein from a 3-ounce serving of tilapia, 21 grams of protein from a 3-ounce serving of haddock or rockfish and 20 grams of protein from a 3-ounce serving of rainbow trout, Pollock or cod. Fish with less protein include flounder, with 19 grams per serving, catfish, with 17 grams per serving and swordfish, with 16 grams per serving.